"a balance of action and relaxation"
A calm, warm breeze blows through as reflected sunlight gently flickers across the serene waters of the Eibsee, not far outside of Munich. Five young models descend the slight slope to the shore before setting out onto the water. They set out not on boats, not on jet-skis, but on boards. Standing on their boards, they use long paddles to propel themselves forward, and use a combination of paddling and balance to steer through the water. 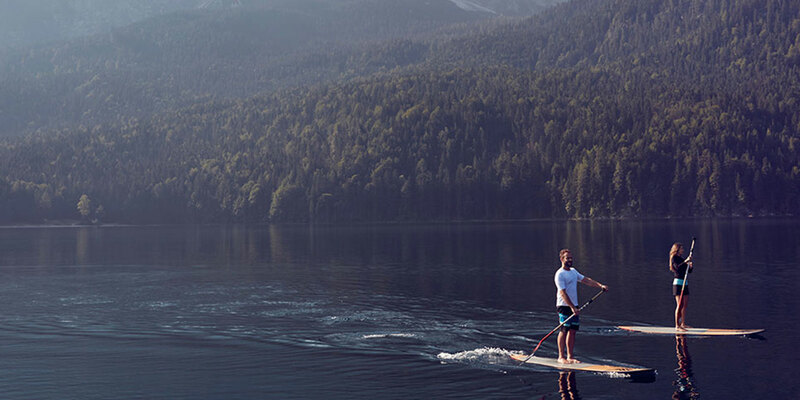 Stand-up paddle-boarding (SUP), is not exactly new, but has only recently entered popular sport culture: nonetheless, it has inspired the designers of Bogner Fire + Ice. Like the winter sport of snowboarding, SUP merges fast-action intensity with serene intervals: it captures the feeling of catching your breath on a precipice of nature that is the Fire + Ice lifestyle. For the SUP-inspired Fire + Ice Spring/Summer 2016 collection photo-shoot, three passionate SUP’ers were casted via social media to model the collection on SUP boards, along with two professional models. Each of them found the sport in a different way, but all of them fell in love with it quickly. One of the people cast for shoot was Marina, 27, from Munich. Marina says that much of the appeal of SUP for her comes from its accessibility: “I need only drive a few minutes out of the city to a lake to do it, or I can even do it in the city on the Isar.” Due to its flexibility regarding means of forward propulsion, be it by paddle or by wave, SUP can be done on just about any body of water in any weather: even on tumultuous ocean waters. The health benefits of the sport are also a significant drawing-factor for many: SUP is a full-body workout that does not have the chaotic, stressful intensity that comes with many other sports. In fact, some people do yoga while riding their SUPs. Talking to the lead designer of Bogner Fire + Ice, Thomas Becker, it’s clear why SUP was chosen as the inspiration for the collection. “[SUP] fits Fire + Ice very well. There’s this balance between it being a relaxed sport done on calm waters, as well as an action sport on high waves.” Thematically, the pieces in the new summer collection mirror this idea of balance: balance between action and reflection, between style and function. They center on the context of the SUP sport, and how it fits into day-to-day summertime lifestyle. Thus, the collection itself is not designed to be a simple summer collection or strictly a beachwear collection. Functional T-shirts and long-sleeves are outfitted with rush-guards to ensure wearer-comfort while surfing, as are the board-shorts. These same pieces are also enhanced with quick-dry and anti-UV technologies for optimal transitions from water to land as well as long days in the sun. While not all of the new collection is functional-wear designed specifically for SUP, the essential feeling of the sport is also incorporated into the casual-wear. Casual T-shirts with water-inspired imagery, colors and patterns dominate the core of the main-season collection in combination with understated, simple bottom-pieces, some with surf-inspired, wide single-stripe details.